The Reviewer Blogger Template is a super professional blogger template. 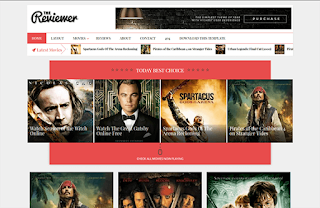 The Reviewer blogger template is designed for movie promotion, presentation of projects, films, images, events and much more. This theme supports YouTube videos. This is very easy to customize. We created every element as a widget so you can easily put it almost anywhere. This template is universal so it can be used for any site. Wow..amazing..really I like it keep in touch from Indonesia.